Mohammed Farid has completed his BE in Chemical Engineering from the University of Baghdad(1971), ME and PhD in Chemical Engineering from University of Swansea, Wales (1975 and 1977). He is Fellow of the Institution of Chemical Engineers, He has published more than 380 papers in international journals and refereed international conferences, 6 patents, 5 books, and 11 chapters in books. Professor Farid has received a number of international awards such as the Matsumae International Fellowship (1986), the Hisham Hijjawi Award (1993) and the Marie Curie Fellowship (2010). In 2010, he was short listed and came in the third place for the IChemE Innovator of the Year Award – sponsored by NES in the UK. He was invited as a keynote speaker to a large number of international conferences and to be in the editorial board of international journals. In this presentation, the possibility of converting low-grade vegetable oil or tallow available widely in New Zealand into biodiesel and energy materials will be discussed in an effort to improve the economy of this process. Currently established processes use alkali catalysts such as sodium hydroxide to trans-esterifies any source of lipid using methanol at low temperatures and pressures. However, the manufacturing cost of biodiesel produced remained high, making biodiesel more expensive that petroleum diesel, especially if high grade feedstock is used. Three possible approaches, which may improve the conversion of low grade lipid into biodiesel or useful chemicals, will be discussed in this presentation: development of gas phase reactor in which the trans esterification reaction takes place only in few seconds rather than many minutes. This is done by spraying the oil or molten tallow into fine droplet against methanol vapor at elevated temperatures, react glycerol, which is a waste product from the biodiesel manufacturing, with the free fatty acid present in the low grade tallow or oil according the esterification reaction shown. The produced monoglycerides can then be easily trans- esterified. This will prevent the harmful saponification reaction, which could consume the catalyst, and use of higher alcohol having higher solubility of the lipid to ease biodiesel production and also to produce energy materials, known as a phase change materials, that can be used to improve energy managements in buildings. In addition the potential of growing and harvesting algae in wastewater for the production of biodiesel will be also discussed. Farid, M.M. and Behzadi, s. “Method of Biodiesel Preparation” International Patent WO 2007/049979 A1, 3 May, 2007, US Patent 2009/0038209, Feb., 2009 and PCT/NZ 2006/000277. Behzadi, S. and Farid, M. “Title: Production of Biodiesel Using a Continuous Gas-Liquid Reactor, Bioresource Technology, 100,2, 2059-2062 (2008). Barzin R, Chen JJJ, Young BR, Farid MM. Application of PCM energy storage in combination with night ventilation for space cooling Applied Energy 158:412-421 Article number C Nov 2015. Mehrabadi A, Farid MM, Craggs R. Variation of biomass energy yield in wastewater treatment high rate algal ponds Algal Research 15:143-151 Article number C, 2016. Irene M. C. Lo is currently a full professor in the Department of Civil and Environmental Engineering at The Hong Kong University of Science and Technology (HKUST) and has been joining HKUST since 1992. She received her Master and PhD degrees in Civil (Environmental) Engineering from the University of Texas at Austin. Prof. Lo is an elected Academician of the European Academy of Sciences and Arts (EASA). She is the first Hong Kong scholar inducted into the EASA. She is an elected Fellow of the Hong Kong Institution of Engineers (FHKIE), and elected Fellow of the American Society of Civil Engineers (FASCE). Prof. Lo has held 2 patents, edited 9 technical books, and published over 270 SCI journal articles and conference papers. Her research areas include solid waste treatment and management; magnetic nanomaterial-based technology for water and wastewater treatment; soil/sediment/groundwater remediation; and fate and transport of nanoparticles. Food waste represents a major constituent of the municipal solid waste in urban cities while it can be used to produce useful products if well managed. In Hong Kong, the local Government has planned to employ anaerobic digestion to produce biogas from food waste. In consequence, the biogas produced can be converted into different forms of energy use, such as electricity and heat, city gas, and biogas fuel for vehicle use. It is essential to determine the best option for converting food waste based on their environmental performance so as to strive for a sustainable waste management system. In this study, life cycle assessment is conducted to evaluate the life cycle environmental performance of different food waste converting options (i.e., electricity and heat, city gas, and biogas fuel for vehicle use). The LCA is conducted using SimaPro 7.2.4 software with ReCiPe version 1.04 to evaluate both the impact and damage categories. For impact categories, climate change is the key impact category and it is found that biogas fuel as petrol substitute has achieved the best environmental performance compared to other converting options with -103.67 kg CO2e/tonne food waste. If 1,080 tonnes per day of food waste can be converted into biogas fuel as petrol substitute, approximately 2% of greenhouse gas emissions can be reduced in the transport sector in Hong Kong. Chiu, S.L.H. and Lo, I.M.C. (2016). Reviewing the anaerobic digestion and co-digestion process of food waste from the perspectives on biogas production performance and environmental impacts. Environmental Science and Pollution Research, In press. Chiu, S.L.H., Lo, I.M.C., Woon, K.S. and Yan, D.Y.S. (2016). Life cycle assessment of waste treatment strategy for sewage sludge and food waste in Macau: perspectives on environmental and energy production performance. The International Journal of Life Cycle Assessment, 21(2), 176-189. Woon, K.S. and Lo, I.M.C. (2016). A Proposed Framework of Food Waste Collection and Recycling for Renewable Biogas Fuel Production in Hong Kong. Waste Management, 47, 3-10. Woon, K.S. and Lo, I.M.C. (2014). Analyzing Environmental Hotspots of Proposed Landfill Extension and Advanced Incineration Facility in Hong Kong using Life Cycle Assessment. Journal of Cleaner Production, 75: 64-74. Kunio Yoshikawa was born in 1953 in Tokyo, Japan. He is a professor of Tokyo Institute of Technology and an associate editor of Applied Energy. His bachelor, master and doctor degrees were awarded from Tokyo Institute of Technology. His major fields are energy conversion, waste management and environmental engineering. He has been working in Tokyo Institute of Technology for more than 38 years as a research associate, an associate professor and a professor. He has published nearly 200 journal papers with the major award of AIAA Best Paper Award, ASME James Harry Potter Gold Medal, JSME Environmental Technology Achievement Award and Best Educator Award of Tokyo Institute of Technology. A portable and small-scale biomass gasification system has a potential for use in damaged areas by natural disasters (earthquake, flooding, Tsunami, etc.) or un-electrified rural areas in developing countries. However, the available feedstocks are usually high moisture content ones with different size, shape and properties. Therefore, some pretreatments are essential for efficient gasification of these feedstocks. In this study, woody biomass samples were first carbonized/torrefied by a carbonizer without usage of electricity. Then the carbonized/torrefied biomass were crushed and molded into briquette shape to be supplied into a fixed bed updraft gasifier. 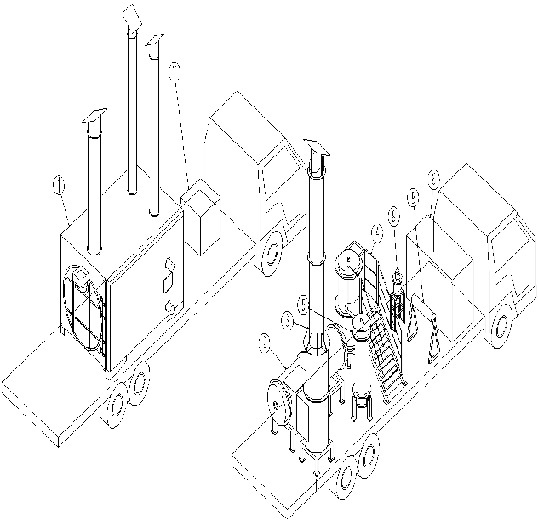 The syngas produced in the gasifier was first cleaned up by physical tar removal processes (the oil scrubbing, the centrifuge misty tar collection and the char bed adsorption) and was then supplied into a gas engine with 30kW electrical output. In the presentation, some detail results on the carbonization/torrefaction process, the briquetting process, the gasification process, the gas clean- up process and the gas engine operation will be presented. Then the mass balance and the energy balance of the total system will be analyzed to show the self-sustainability of this system. This work was supported by Innovative Science and Technology Initiative for Security, ATLA. 1. Hu Wu, Qi An, Yafei Shen, Noboru Harada, Lihao Chen and Kunio Yoshikawa (2015) The CO2 Gasification Kinetic Study of WEEE Plastic Char Derived from Medium Temperature pyrolysis. Energy and Environment Research 5: 82‐93. 2. Shunsuke Nakamura1, Siriwat Unyaphan, Kunio Yoshikawa, Shigeru Kitano, Shuji Kimura, Hiroyuki Shimizu and Kazuya Taira (2014) Tar removal performance of bio‐oil scrubber for biomass gasification. Biofuels 5: 597‐606. 3. Yafei Shen, Peitao Zhao, Qinfu Shao, Dachao Ma, Fumitake Takahashi and Kunio Yoshikawa (2014) In‐situ catalytic conversion of tar using rice husk char‐supported nickel‐iron catalysts for biomass pyrolysis/gasification. Applied Catalysis B: Environmental 152‐153: 140‐151. 4. Bayu Prabowo, Kentaro Umeki, Mi Yan, Masato R. Nakamura, Marco J. Castaldi and Kunio Yoshikawa (2014) CO2–steam mixture for direct and indirect gasification of rice straw in a downdraft gasifier: Laboratory‐scale experiments and performance prediction. Applied Energy 113: 670‐679. 5. A. Paethanom P. Bartocci, B. D’ Alessandro, M. D’ Amico, F.Testarmata, N. Moriconi, K. Slopiecka, K. Yoshikawa and F. Fantozzi (2013) A low-cost pyrogas cleaning system for power generation: Scaling up from lab to pilot. Applied Energy 111: 1080-1088. Boon Leong Lim is an Associate Professor of the School of Biological Sciences at the University of Hong Kong. He obtained a B.Sc from the Chinese University of Hong Kong in Biochemistry (1990) and a Ph.D. degree from the University of Oxford (1994). Dr. Lim has published over 60 original articles and his current research interests focus on carbon flow of plants, plant organelle biology and Omics biology of plants. He has filed a few patents on agrobiotechnology and some of his patents have been successfully licensed to private companies. Increasing yield has been the ultimate goal of Agrobiotechnology and Biofuel industry for many decades. Current agrobiotech traits mainly rely on preventing yield loss, such as insect-resistance, herbicide resistance and drought resistance. Here we would like to show that manipulation energy outputs of chloroplasts and mitochondria can enhance plant growth and seed yield significantly. 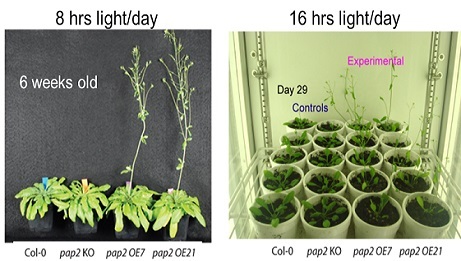 Overexpression (OE) of a purple acid phosphatase (AtPAP2) in Arabidopsis results in faster plant growth and higher seed yield (+40-50%). The OE lines contain significant higher ATP and sucrose levels than the wild-type (WT). Subcellular localization studies showed that this phosphatase is anchored on the outer membranes of the two energy generating organelles of plants, chloroplasts and mitochondria. Our data show that AtPAP2 affects the energy output from these two organelles by modulating import of certain nuclear-encoded proteins into chloroplasts and mitochondria, and thus affect their energy harvesting and energy conversion efficiencies, respectively. Based on the data of chlorophyll fluorescence measurement, transmission electron microscopy, 2D Blue Native/SDS-PAGE analyses, enzyme assays, oxygraph measurement, and proteomics analysis, we proposed a model to explain how AtPAP2 enhances sugar and ATP production in leaf cells of Arabidopsis thaliana by simultaneously coordinating the activities of chloroplasts and mitochondria. Homologous sequence of AtPAP2 can be found in the genome of some green algae. Our discovery may open up a new direction for Agrobiotechnology and bioenergy research. C. Liang, …, B. L. Lim (2016) Transcriptomic, proteomic and metabolic changes in Arabidopsis thaliana leaves after the onset of illumination. BMC Plant Biology 16:43. C. Liang, …, B. L. Lim (2015) Impacts of high ATP supply from chloroplasts and mitochondria on the leaf metabolism of Arabidopsis thaliana. Frontiers in Plant Science 6:922. Y. Law, …, B. L. Lim (2015) Phosphorylation and dephosphorylation of the presequence of pMORF3 during import into mitochondria from Arabidopsis thaliana. Plant Physiology 169:1344-55. C. Liang, …, B. L. Lim (2014) Global small RNA analysis in fast-growing Arabidopsis thaliana with elevated concentrations of ATP and sugars. BMC Genomics 15:116. F. Sun, …, B. L. Lim (2013) Global transcriptome analysis of AtPAP2 - overexpressing Arabidopsis thaliana with elevated ATP. BMC Genomics 14:752-763. F. Sun, …, B. L. Lim (2012) AtPAP2 is a tail-anchored protein in the outer membrane of chloroplasts and mitochondria. Plant Signaling & Behavior 7:927-932. Y. Zhang, … B. L. Lim (2012). Over-expression of AtPAP2 in Camelina sativa leads to faster plant growth and higher seed yield. Biotechnology for Biofuels 5:19-28.